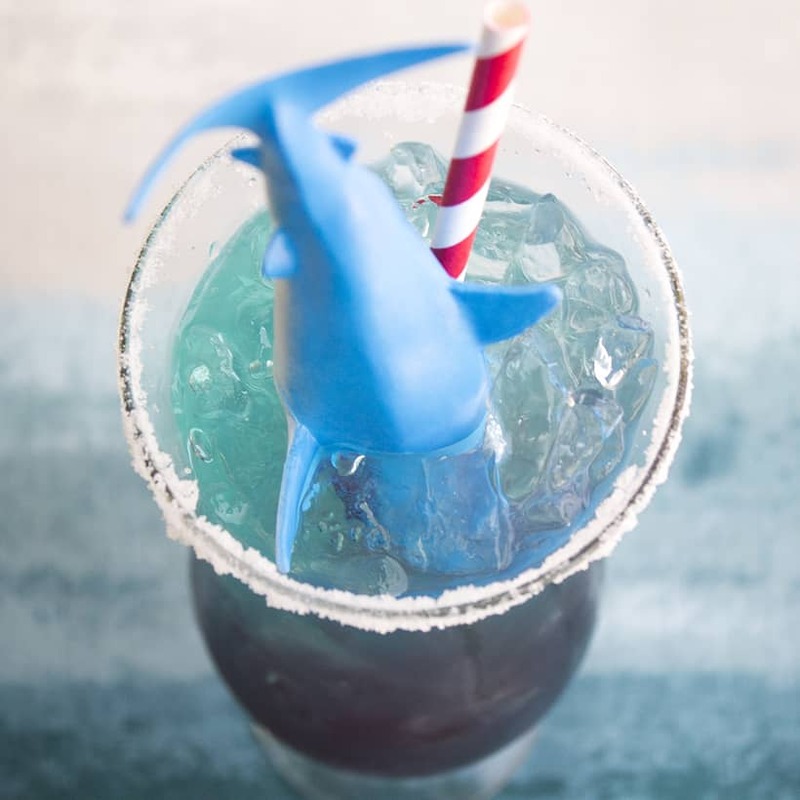 A Shark Attack Blue Margarita is the best cocktail to watch every minute of the great white hunts and shark attack recaps on Shark Week! Are you guys pumped for Shark Week?! I’ve been watching Shark Week since I was a kid even if I fell off the wagon here and there. Now that my boys are big enough to think sharks are freaking sweet, my love for Shark Week has been renewed! We watch all the great white and hammerhead hunts and the boys get so anxious to find a “mega huge shark.” I live for the sharks that breach in South Africa. They’re SO COOL! To celebrate this year’s Shark Week I made a super fun viewing party cocktail just for the adults. 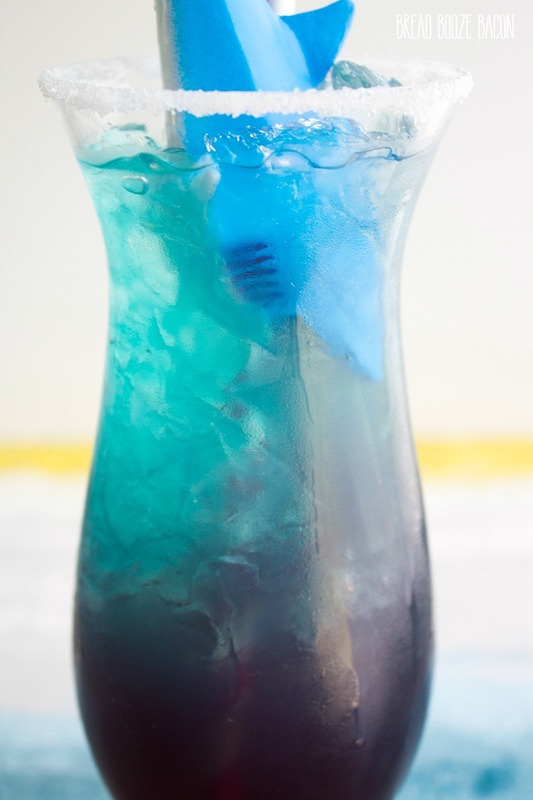 My Shark Attack Blue Margarita recipe takes the best margarita I’ve ever had (Mike’s blue curacao margarita) and combines it with grenadine for a cherry margarita that’s good to the last drop! My favorite part is the bleeding effect. Literally. 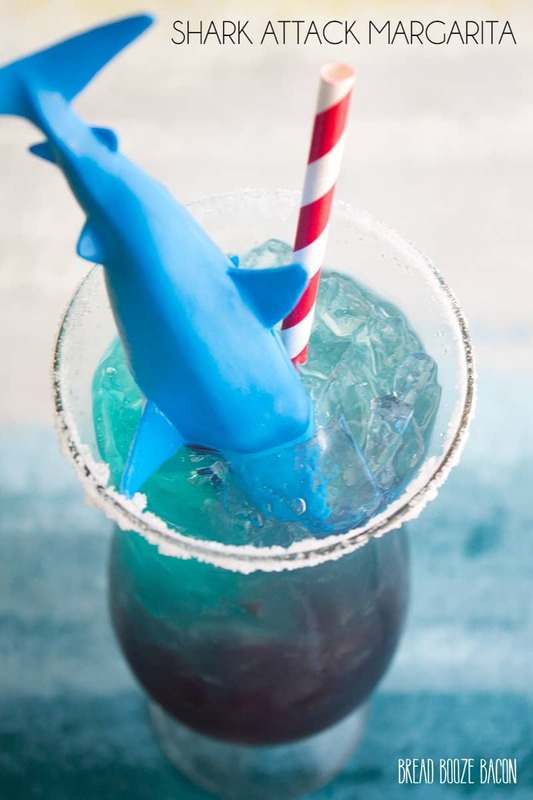 Once you turn the shark over into the glass, the grenadine bleeds into the blue margarita and it looks pretty bitchin’! I do recommend a non-traditional glass for your margarita, like a hurricane glass, so you can really see the blood seep into the water. 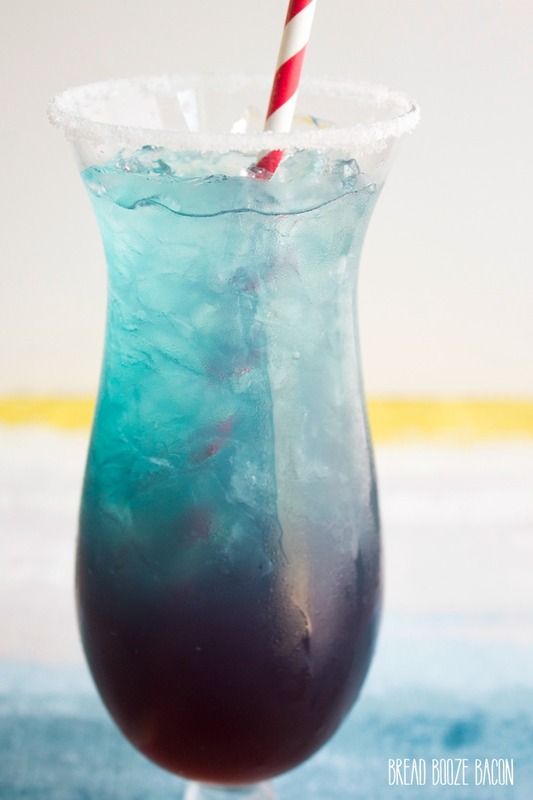 Add tequila, sweet and sour mix, Cointreau, and blue curacao to a cocktail shaker with ice. Rim a cocktail glass with salt. Strain margarita into the glass and garnish with a lime wedge or wheel. Since we couldn’t help ourselves, our blockbuster bloggers group put together a few extra little goodies for the most anticipated week on TV! These Shark Week themed recipes and crafts are perfect for underwater and shark-themed birthday parties too! I’m dying over those bookmarks! I think my little bookworm is going to need one for each of his books. If you’re planning to have your own Shark Week viewing party with friends, grab my free printable invitation below! My Shark Attack Margarita is the best cocktail to watch every minute of the great white hunts and shark attack recaps on Shark Week! Fill a cocktail shaker with ice. 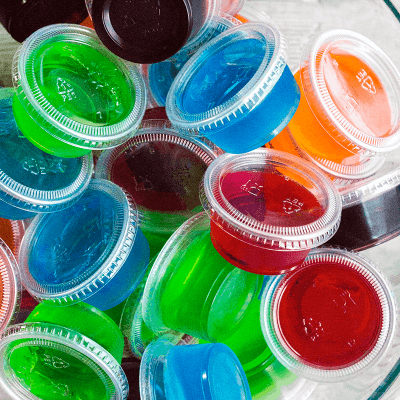 Pour in the tequila, Cointreau, blue curaçao, and sweet and sour. Shake vigorously for 30 seconds. Cut a slit in the center of the lime wedge and then place it on the rim of your glass. Run the lime wedge around the entire glass to get the rim wet. Remove the lime wedge and dip the rim into the margarita salt. Fill the glass with ice, being careful not to knock the salt off the rim. Remove the lid of the shaker, and strain the margarita into the glass. Place one test tube inside one shark until it is all the way in. The test tube will stick out a little bit. Fill the test tube with grenadine until you can just see the grenadine above the shark's mouth. 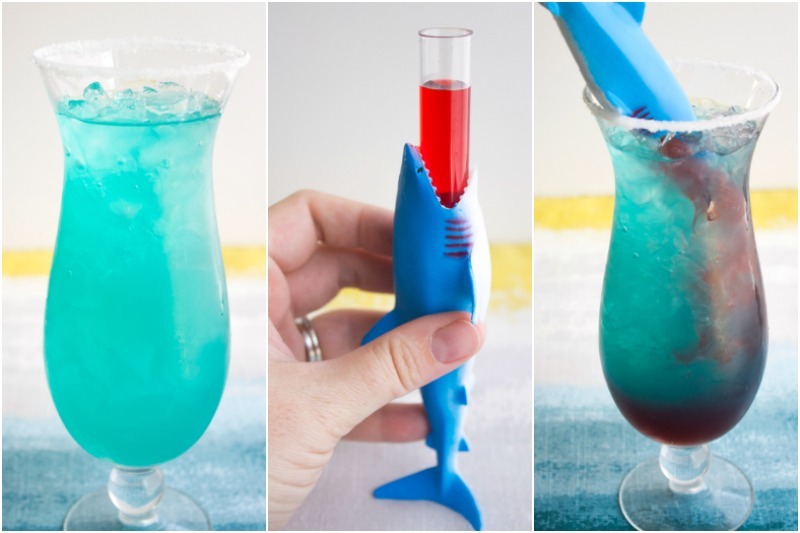 When you're ready to serve, quickly turn the shark over into the margarita and plunge the test tube (and shark's head) into the margarita so the grenadine slowly bleeds out into the cocktail. 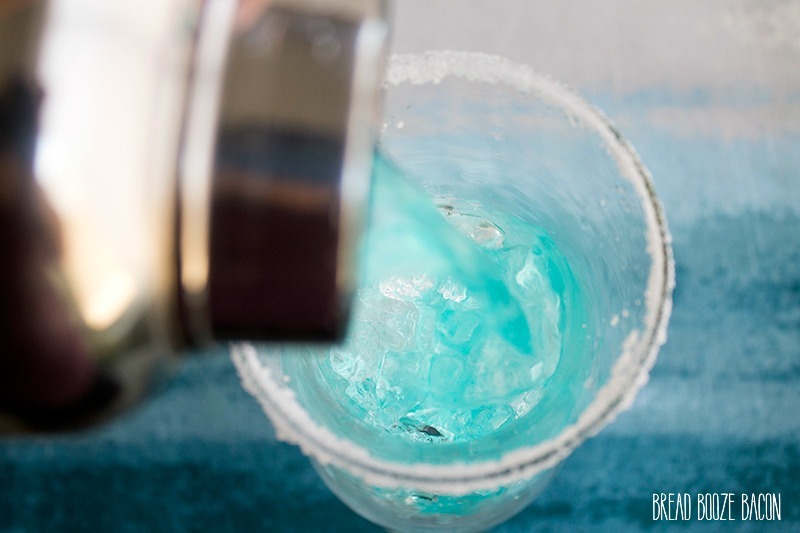 Place the margarita salt on a small plate, making sure the surface area of the salt is at least as wide as the rim of your glass. 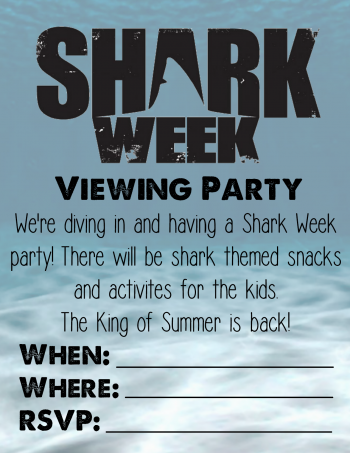 Host your own Shark Week viewing party with our free printable! Hi! Love this recipe but where did you buy the plastic sharks? I am having trouble finding some. Thank you! Hi Jillian!! I got them on Amazon. 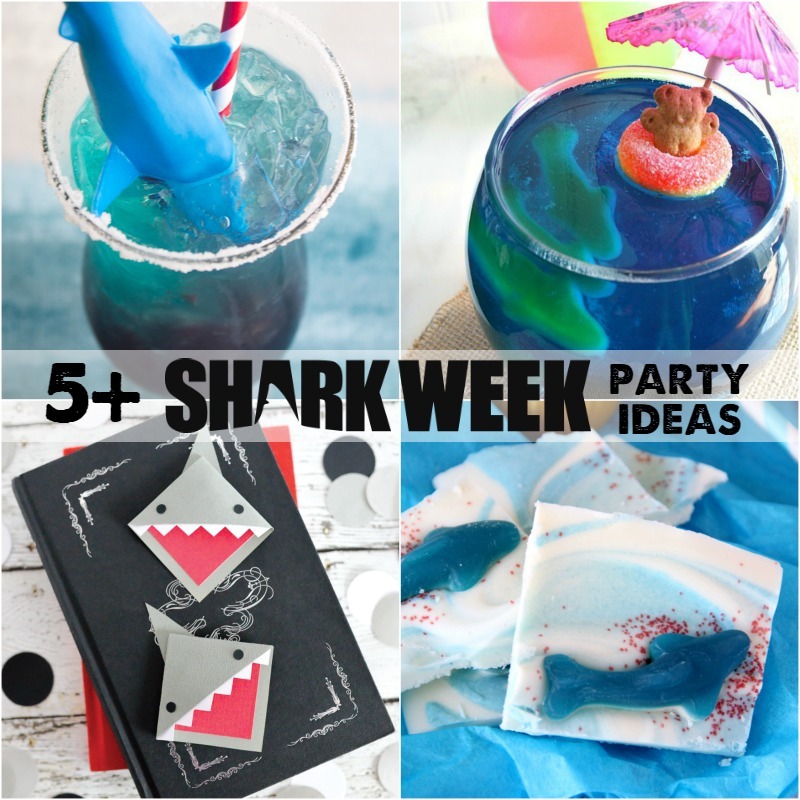 I am so excited to make these drinks for shark week!!! Thank you for adding the links for the tubes and the sharks, very helpful.